OMG! I’m in love with this scarf! 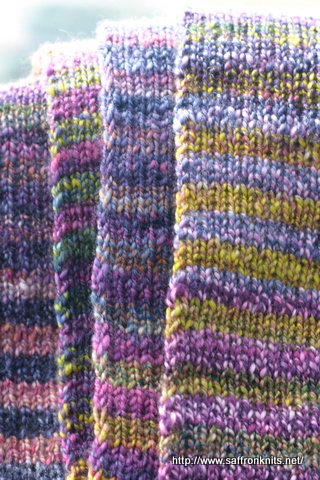 It’s inspired by the Noro Striped Scarf on the BrooklynTweed blog and the Pass-through scarf. I can’t put it down. When I working some of my other knitting project (which I love as well), this project is like my reward. Currently, it is over 62 inches long and I only have a little bit of yarn left. I’m using two skeins of my handspun that is sock/sport weight with size 3 needles. (I put rubber bands on the ends of a couple of DPN and it works great!). 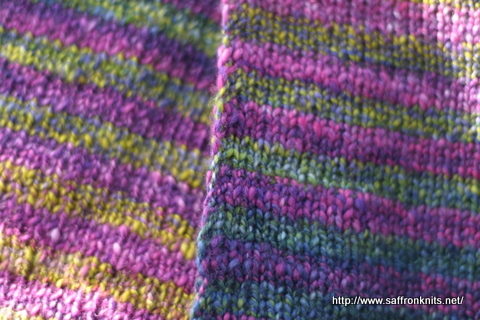 I cast on 55 stitches (1×1 rib +1), changing colors every 4 rows and am carrying the yarn up the side. I learned and used a ‘new’ cast-on just as I finally got the stitch count for the width I wanted. It’s the Reversible Contenintal/Long-tail cast-on. I had gotten Knitting Daily TV series 300 DVD set from the library and was kinda listening and looking up occaisionally but when Eunny Jang demonstrated this cast on in episode 303, I sat up and paid attention. I found a tutorial of it on YouTube (but if you can see the DVD with Eunny Jang, I highly recommend it). I used this cast-on for this scarf and I really like how it looks. 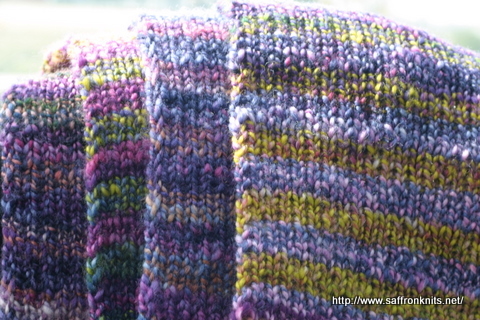 Ok… gotta go … must … knit … more … stripes!!! 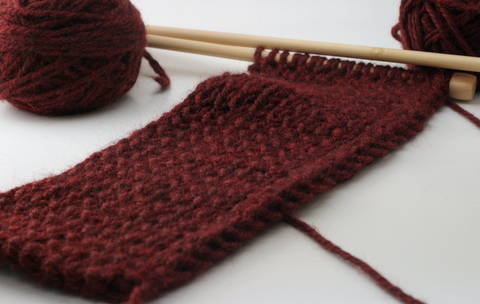 I’ve been obsessed with knitting lately… and loving it! Previously, I’d only have about one to three project going at a time. This year that fell apart and it’s been bugging me most of the year. Well no more. Instead of being bothered by it, recently I have embraced it and started three more projects – all of which I equally enjoy knitting. I know there is an ebb & flow to creative energy so I just riding this wave for as long as I can. - Two skeins of Alpaca with a Twist’s Big Baby in the Lumberjack colorway. I’d been wanting to make a ribbed scarf with it and am so happy to be finally using it. (I bought it in 2008). It’s SO soft and has wonderful drape. The pattern calls for a provisional cast-on and I tried that. I’d never tried to knit from a provisional cast on and the fuzziness of the yarn made it hard to figure out what I was doing. Plus, I didn’t like how it looked. So I ripped it out and started over, despite being over 50% done. I just knew I wouldn’t be happy with how it looked. Since the yarn is bulky, I’ll be back to where I was in no time. Normally I dislike sharing yearly goals, but for some reason, this year is different. First, I learned last year that joining project specific knit-a-longs is not for me. Invariably, as soon as I join, I no long want to make the item. So, I’ve decided to participate in a year long gift-a-long, started by the wonderful Marce. The goal is avoid that last minute stress of gift knitting. Even if I have a goal of knitting one thing a month, I’m still ahead of the game. I’ve also decided to join Dave in his ‘Spinning My Wheel‘ quest. But I’m gonna call it ‘Spinning My Spindle’. At any rate, I’ll be spinning along and trying to keep track of my spinning efforts. But sadly, I’ve hardly spun anything this year. But the year is not over, right? And I have one more goal for this year. 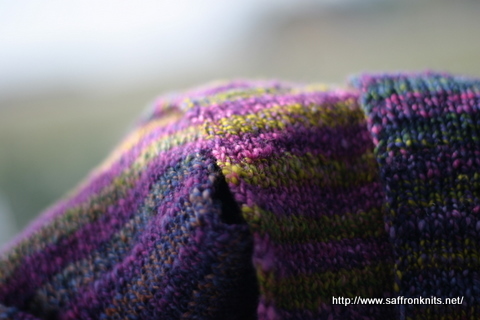 To knit a sweater – something I’ve always wanted to do. I did consider making The Cobblestone Sweater, but now Tiennie has kindly shared her pattern for The Fog Sweater, which I love very much. But that’s a decision for later. First, I’m reading ‘The Sweater Workshop‘ that I got from the library. I’m up to reading about two-color knitting and stranding. I figure, if I can get some comprehension about the different techniques first, when I actually start working on that sampler, it won’t be as scary. At least that’s my hope. 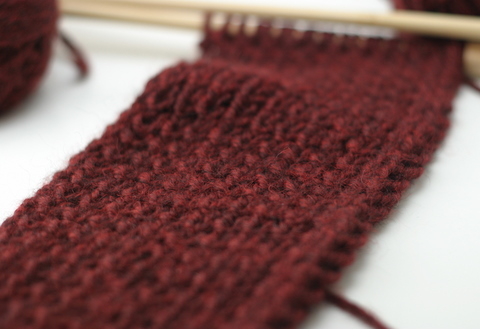 And so as to not to be completely void of photos, here’s a photo of my scarf-in-progress. I started a new project yesterday. 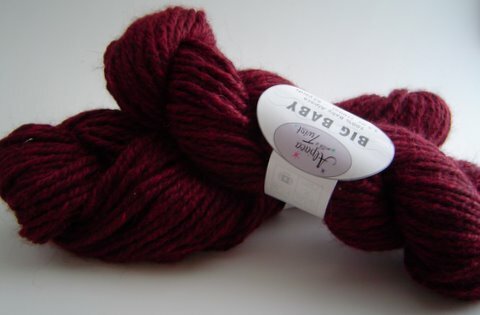 The yarn, called fusion, is 287 yards of squishy soft merino handspun by FatCatKnits. I love knitting with handspun. It has ‘personality’ and ‘character’, feels nice between the fingers and is generally fun to work with. I’m making a ‘Woven Stitch Scarf’ from Ella Rae Designs Book One. It calls for US Size 15 (10 mm) needles so hopefully it’ll go quickly. You’re supposed to cast on 15 stitches, but I think this yarn is thinner than the yarn used in the pattern so I cast on 19 stitches because 15 stitches was too thin, in my opinion. I just hope I have enough yarn for a decent length scarf. This will make a nice gift for someone one day. The fingerless mittens (which are NOT blue, by the way) are stalled. The first one is 97% finished (still needs a thumb) and the 2nd one I’ve had to rip parts out twice – first because I forgot to switch to larger sized needles, then, while working the thumb gusset, I had an odd number of stitches for the gusset when I need an even number. So, I’m working on the scarf for now and I’ll go back to the fingerless mitts in a bit.